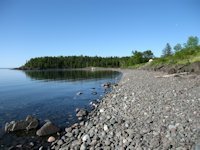 Northeast of Temperance River State Park, you will enter the Arrowhead Region whose unofficial capital is Grand Marais, Minnesota . 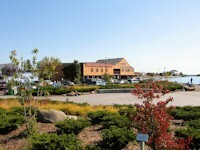 . . one of our favorite towns along Lake Superior. But before you get there, make time for some of the hiking. Seven miles down the road is Forest Rd 336. Go 2 miles inland to the SHT parking lot for Oberg Mountain. 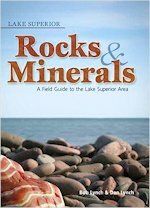 The hiking trail is about 2.25 miles and includes several overlooks of Lake Superior, Oberg Lake, and a number of other high peaks along the North Shore. Here's a SHTA map that includes Oberg Mtn trail, an article in Gorp on a fall Oberg hike, and an article on our own Fall Color hike to Oberg Mountain. 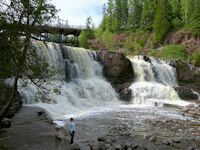 A little further down the road towards Grand Marais is a second worthwhile hiking opportunity among the numerous trails in the Cascade River Sate Park. If you don't have a day sticker for the park, there is a small no-fee parking area along highway 61 by the river. 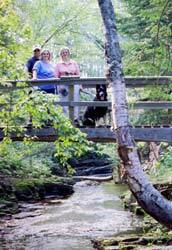 Another worthwhile stop is about 5 miles before Grand Marais: the Cut Face Creek Wayside Park. While the bathrooms are eco-toilets, they are new and clean. 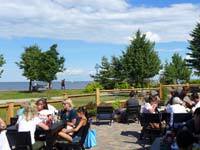 The picnic area overlooking the lake should win landscape awards . . plus there's a great rock picking beach here. Cascade River State Park's campground is more removed from the highway than the Temperance River State Park camping area and will be more "buggy" and "dusty" during certain times of the year. 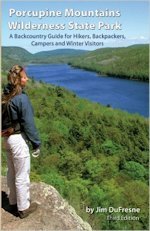 The primary attractions of the Cascade River State Park are numerous hiking trails: some run along the lake, others to Lookout Mountain and Moose Mountain, and hiking the trails on both sides of the river with its scenic waterfalls and cascades. 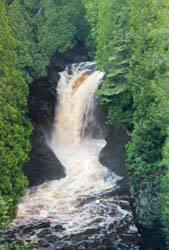 Here's a shot of the "Cascades" of the Cascade River taken from a hiking bridge that crosses the river. 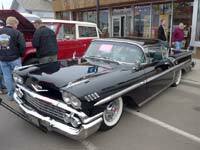 Parking is available off Highway 61 next to the river. The round trip hike to the Cascades is less than an hour's trek. On the way to the Cascades, you pass Cascade Falls. See more pictures of Cascade River and Lookout Mountain here. Grand Marais harbor. Artists Point left center, main harbor center to extreme right. 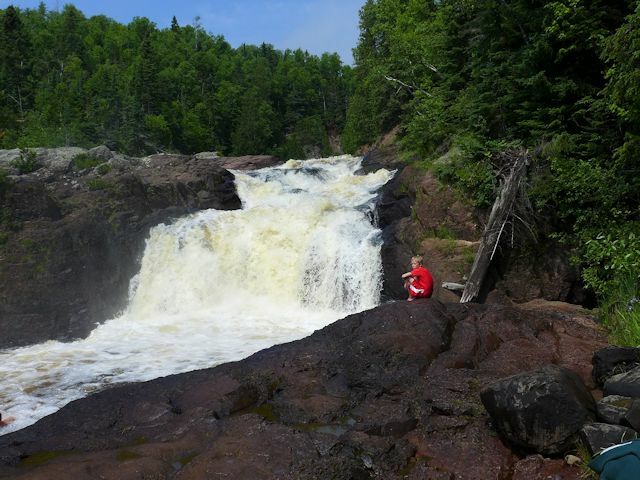 Hiking Trails near Grand Marais. About 2 miles (north on Hwy 12) up the Gunflint Trail from Grand Marais, there is a trailhead parking area for the Superior Hiking Trail. A nice overlook of Grand Marais. (pictured above). If you are in the mood for a day hike, following the SHT east leads to Pincushion Mountain (pictures here) and the Devil Track River Gorge. Here's Jo and Hans at the top of Pincushion Mountain. As guests of the the Wedgewood Motel (2 miles NE of Grand Marais), we shaved about an hour off the travel time to the top by using the spur trail that originates from behind the motel. There's another hiking trail a few miles further up the Gunflint Trail from the Pincushion Mountain trailhead where the road runs past Northern Light Lake. Look for the sign indictating a half-mile hiking trail to a peak with an overlook of the lake. 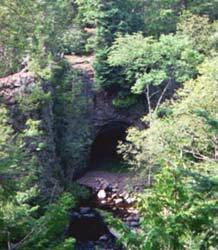 < < < A nice day hike northeast of Grand Marais is from the Kadunce River Wayside along Highway 61. You travel adjacent to the Kadunce River gorge to the intersection with the Superior Hiking Trail bridge. Judge Magney is 14 miles north of Grand Marais on Highway 17. 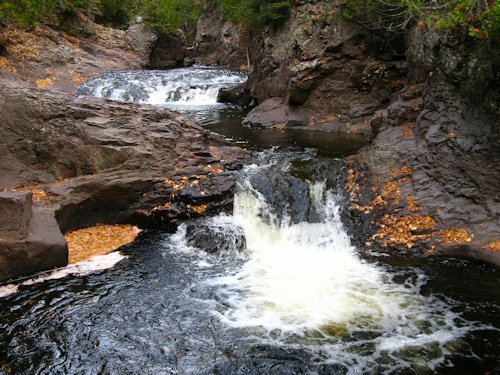 Here a portion of the Superior Hiking Trail runs away from Lake Superior along the Brule River. The scenic attraction on this hike is the The Devils Kettle waterfalls. At the bottom of the falls is a sink hole where part of the river disappears to parts unknown! 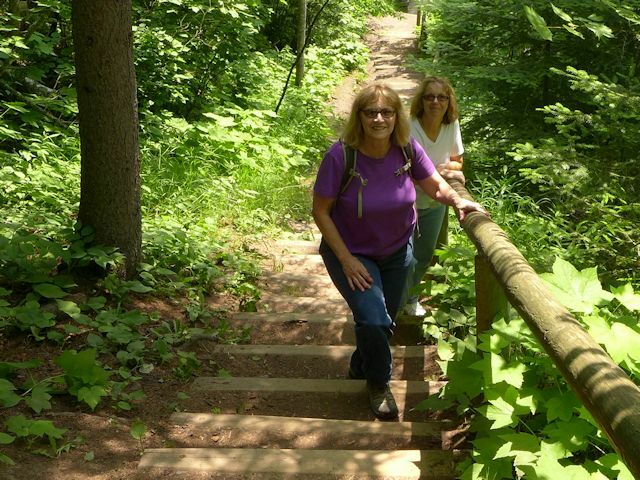 You'll get plenty of exercise on the hike as there is a significant elevation change on the way to the falls and kettle, including several sets of stairs (over 500 steps in all). To hike the trail, you'll need a day pass to park in the Judge Magney State Park parking lot. 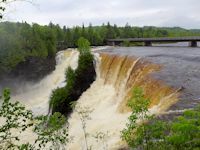 Grand Portage has no camping facilities but has a visitor center and a short handicap accesible walking trail to one of the most impressive waterfalls around Lake Superior - The High Falls of the Pigeon River. You'll also need a Minnesota day park pass (although if you got one the same day at Judge Magney then it will also be good here. The Pigeon River forms the Minnesota-Ontario border at this point and is a historic voyageur canoe route. 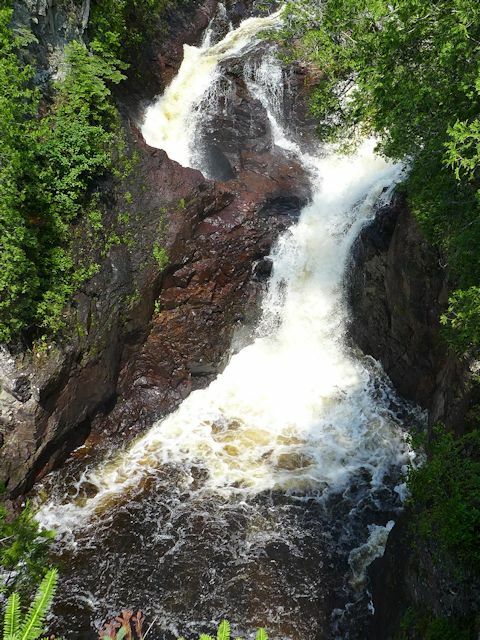 At 130 feet, High Falls is the second highest falls around Lake Superior - exceeded only by Kakebeka Falls . . . which would be your next "waterfall stop" as you travel into Canada to continue your Lake Superior tour. Before you cross the border, well worth a visit is the historical reconstruction of the old Grand Portage Trading Post, complete with re-enactors of the period. The Grand Portage Heritage Center has a museum, interactive exhibits, and a theater providing interesting insight into the voyageur era. 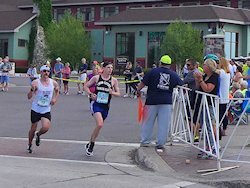 Also see the beginning of the historical Grand Portage Voyageur Trail and get a little exercise with a hike to the top of Rose Mountain with a view of the Grand Portage bay. The annual re-enactment of the Grand Portage Rendezvous is the second weekend in August. See our article on North Shore Waterfalls & Dining at Naniboujou Lodge.